Does Temperature Affect How High a Tennis Ball Will Bounce? If you are looking to add a bit of friendly sabotage to your tennis opponent's game, consider popping a few of his tennis balls in the freezer beforehand. When a tennis ball's temperature changes, the ball's gas-filled core undergoes an interesting reaction. While a temperature change in one direction has a high-bouncing effect, a temperature change in the other direction reduces the ball's bouncing abilities. The anatomy of a tennis ball features a hollow rubber-like core filled with gas. The molecules that make up gas are relatively unorganized; they readily slide around and over one another to fill up any space they occupy. As such, gas molecules can easily expand or contract. When a tennis ball hits the ground, the force presses up against the ball, pushing the bottom surface of the ball in and compressing the gas inside its core. As the tennis ball returns to its normal shape, the gas inside the ball acts as a spring and causes the ball to bounce into the air. The pressure of the gas inside the ball ultimately determines how high the tennis ball will bounce. The scientific equation for determining the pressure of gas is "p=rRT," where "p" is the pressure, "r" is the density, "R" is a constant specific to the gas and "T" is temperature. If the density and the constant remain the same, a higher temperature results in higher pressure, while a lower temperature results in lower pressure. When the temperature increases, the gas molecules inside the tennis ball expand. As the molecules expand, their energy increases as they bounce around more erratically. This increased energy and movement results in a higher bounce. On the other hand, a temperature decrease causes the gas molecules to contract and move around more sluggishly. As a result, a cold ball has a much lower bounce. This scientific mystery can be demonstrated at home or school with a simple experiment. Gather 15 to 20 tennis balls and a measuring tape. Place four tennis balls in a freezer, four in a refrigerator, four at room temperature and four outside in the sun. Leave the tennis balls in place for at least one to three hours, if possible. Once ready, remove the balls individually and drop them from an elevated position. Have another person measure and record how high the ball bounces. Continue the same procedure until all balls have been tested. You should find that the heated balls bounce the highest, followed by the room temperature balls, then the refrigerated balls, with the frozen tennis balls bouncing the least. 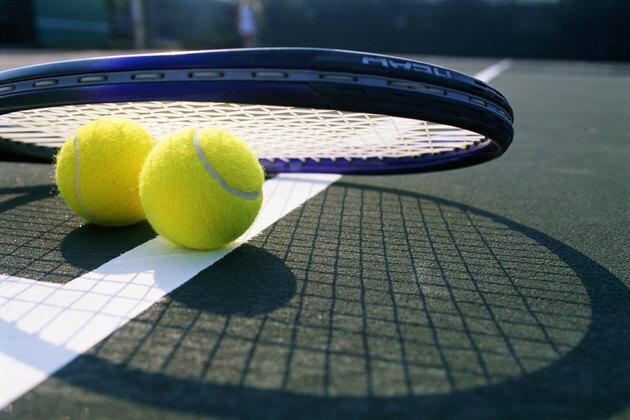 During a game of tennis, most players rely on the ball's rapid bounce to help them play and score. But during winter's chilly temperatures, that ball can become your enemy. To offset the ball's declining bounce, the Tennis.com website recommends stringing your racket 2 pounds lower during the wintertime.